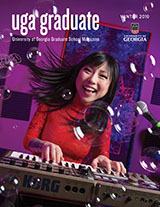 The Graduate School at the University of Georgia will be at the forefront of best practices in graduate education by providing the leadership for an exemplary learning environment in which to educate our next generation of scholars, professionals, and global leaders in a competitive, knowledge-based world. The Graduate School will focus on the following three goals over the next ten years to enhance and enrich graduate student learning. The strategies and action steps identified under each goal will assist in achieving the intended outcomes that support the growth and advancement of graduate education at the University of Georgia. Enhance the quality of graduate education across all programs to protect the value of graduate degrees awarded by the University of Georgia. Assist faculty and administrators in building world-class graduate programs. Support graduate students beginning with recruitment and admission through graduation. Strategy A: Increase our competitiveness in the recruitment of outstanding prospective graduate students. Work with senior administration to establish and maintain nationally competitive financial assistance and other benefits for graduate students. Continue our development efforts with alumni and friends to establish endowed fellowships for graduate students, working in conjunction with senior administration and other colleges and schools. Work collaboratively with faculty, programs, and colleges and schools to develop specific strategies for recruiting and retaining students in all areas of inquiry, including Science, Technology, Engineering, and Math (STEM), the Humanities, and the Social Sciences. Develop and deliver workshops for faculty on best practices in the recruitment and retention of doctoral students. Outcome: Competitiveness with aspirational and peer institutions for the recruitment and retention of high quality graduate students. Benchmarks: Increase in number of competitive assistantships; increase in number of endowed fellowships and sponsored assistantships; recruitment strategies implemented; faculty workshops offered. Strategy B: Broaden the intellectual horizons of graduate students. Offer a range of professional development seminars and certificates that go beyond discipline-specific training to provide students with opportunities to develop skills that prepare them for future careers, both in and outside of the academy. Provide workshops and materials to support students in seeking national fellowships. Work to reduce institutional barriers to receiving benefits, such as health insurance, for student recipients of national fellowships. Work with faculty, programs, deans, and administrators to develop a graduate fellowship program that will allow mid-program students to sample and participate in academic and research activities beyond their program of study, much like the Study in a Second Discipline program for faculty. Explore opportunities with the graduate deans of Georgia Institute of Technology, Georgia State University, and Emory University for graduate students to participate in joint academic endeavors and share academic resources, including encouraging faculty to co-teach seminars and graduate courses across institutions and participate in graduate committees, using distance technology as appropriate. Recognize and publicly acknowledge students receiving awards and national fellowships. Outcome: Prepare graduate students for their future careers. Benchmarks: Number of professional development opportunities offered; number of students applying for external funding; number of collaborative efforts with Georgia Tech, Georgia State, and Emory; record of public recognition of students receiving awards and national fellowships. Strategy C: Work with programs to ensure retention and completion of enrolled graduate students. Work effectively with programs and departments to add value to the graduate experience and best prepare graduate students for the future. Organize best practices seminars for programs to share successful and innovative methods for improving the student experience. Collaborate with the Office of Public Service and Outreach and the Archway Partnership to seek new opportunities for students to engage with the community and demonstrate the impact of their research. Continue to examine and disseminate data for doctoral and master’s completion trends to identify areas of improvement and recognize and publicize best practices. Outcome: Graduate students will have opportunities to develop skills and have experiences to enhance degree completion. Benchmarks: Retention, time-to-degree, and graduation rates; number of best practices seminars; dissemination of data. Strategy A: Encourage and support efforts to offer innovative and interdisciplinary research and learning opportunities for graduate students. Work with other administrative units to remove obstacles and provide roadmaps for the development of innovative and interdisciplinary programs and degrees, including online and international educational opportunities. Provide leadership in collaboration with the Center for Teaching and Learning to create an exemplary learning environment through developing and delivering seminars and workshops for faculty seeking to develop online or hybrid graduate education. Advocate for programs seeking to hire faculty for interdisciplinary positions or joint appointments. Dedicate a portion of new assistantship funding to support competitive assistantships in interdisciplinary programs. Develop a seminar series on innovation in graduate education. Outcomes: An increased level of innovation, interdisciplinary research, and collaboration between academic departments, the Graduate School, and potential regional and international research consortia; better coordination among the Graduate School and faculty members, graduate coordinators, and program directors seeking assistance to advance innovative and interdisciplinary ideas; greater and more creative use of technology, including online learning opportunities, for graduate education; more competitive graduate education programs. Benchmarks: Number of assistantships provided for interdisciplinary programs; letters of support provided for interdisciplinary programs; establishment of an innovation in graduate education seminar; streamlined admissions and student support processes for dual-degree, online, and other innovative programs. Strategy B: Increase the number of interdisciplinary certificates, interdisciplinary degrees, and dual-degrees awarded. Develop a generic Interdisciplinary Studies graduate degree within the Graduate School to allow faculty via a competitive, grass-roots approach to identify and explore new interdisciplinary areas that may lead to new Regents-approved graduate programs. Work with faculty to facilitate development of innovative, interdisciplinary, and dual-degree graduate programs and certificates. Provide support (summer funding, release time, seed grants for departments) for innovative and interdisciplinary curricula development. Identify and develop professional development and certificate programs that provide students the opportunity to gain interdisciplinary experience and expand their knowledge beyond their own discipline. Outcomes: Broader graduate programs of study, including more coursework taken outside the home department; growth in interdisciplinary program enrollments; more dissertation research in interdisciplinary projects; increased enrollment in interdisciplinary/dual-degree and certificate programs; increased number of interdisciplinary/dual-degree graduate degrees awarded. Benchmarks: Number of new interdisciplinary courses, programs, and certificates developed/offered; number of faculty grants awarded for development of innovative and interdisciplinary programs; number of new dual-degree programs; interdisciplinary learning opportunities for students. Strategy C: Support programs and faculty in seeking and receiving grants that support interdisciplinary graduate education. Encourage and participate in the development of Integrative Graduate Education and Research Traineeship (IGERT) and other interdisciplinary grant proposals and provide support for interdisciplinary grants that are funded. Promote new faculty collaborations that will lead to the development of graduate research in interdisciplinary or emerging fields. Work with senior administrators to establish a university-wide seed grant program to stimulate and support opportunities for graduate students to conduct interdisciplinary, cutting-edge research. Outcomes: Increased extramural funding in support of interdisciplinary research; increased participation of graduate students in interdisciplinary research. Benchmarks: Amount of funding received for interdisciplinary grants; faculty collaborations initiated with the assistance of the Graduate School; number of students conducting interdisciplinary or innovative research. Strategy D: Work with campus administrators and faculty to provide space on campus to facilitate conversations about innovation and interdisciplinary research. Work with senior administrators to establish a Graduate Life Center that will provide a space for students, faculty, administrators, and alumni to interact in both formal and informal settings. Work with campus planners and deans of colleges and schools to encourage and establish multiple small spaces on campus to facilitate conversation about innovative and collaborative research among graduate students and faculty. Outcomes: Open, communal spaces to provide opportunities to address broad-based questions of import, raise the intellectual climate of the university, and assist in attracting top graduate students from around the world to our programs. Benchmarks: Establishment and use of a graduate life center; establishment and use of collaborative spaces on campus. Goal 3. Maintain leadership in diversity of underrepresented graduate students. Strategy A: Seek to attain a graduate student body that reflects the people of our state and our nation. Conduct outreach and recruitment efforts with students, particularly among Historically Black Colleges and Universities (HBCU) and Hispanic Serving Universities (HSU). Increase coordination with other UGA programs devoted to increased minority graduate student enrollment. Work collaboratively with faculty, departments, and colleges and schools to strengthen UGA’s marketing and recruitment programs to underrepresented groups. Support programs and administration in efforts to recruit faculty members from diverse backgrounds. Outcomes: Greater UGA visibility on campuses of HBCUs and HSUs; networking established with the faculty from these institutions; increased number of qualified applicants to Graduate School from students at these institutions; a graduate student population representative of the diversity of Georgia. Benchmarks: Number of outreach activities; number of joint programs with other campus units; increase in enrollment of underrepresented students, particularly African American, Hispanic, and women in fields in which they are underrepresented. Strategy B: Provide support to ensure retention and completion of underrepresented students. Continue to develop and refine programs that help underrepresented students succeed in their graduate programs from recruitment to degree completion. Encourage greater emphasis on diversity and inclusiveness in graduate education at the program and departmental levels. Create opportunities for students to interact with an increasingly diverse world as part of their graduate learning experience. Outcomes: Improvements in diversity indicators across campus; equipping graduate students with the skills needed to interact effectively with diverse populations and cultures. Benchmarks: Enrollment of underrepresented students; number of agreements and outreach activities with HBCUs and HSUs institutions; number of activities supporting graduate programs in their recruitment of underrepresented students; participation in and yield from activities conducted by the Graduate School’s Outreach and Diversity Office.